Am now in Argentina and wow what an amazing country - just such a shame that I have run out of time and so cannot explore it properly. Mum and I arrived yesterday afternoon and met up with my lovely friend Reshma. After a naughty celebratory cocktail (now moving from travelling mode to holiday mode) we all headed out for some food and were so surprised to see Mumm champagne on the menu at less than $10 (no Sterling sign on the computers). We ordered an amazing steak, pasta and pizza, plus water and the champers...the total bill at the end of the night came to less than $30 - amazing - I love Argentina! 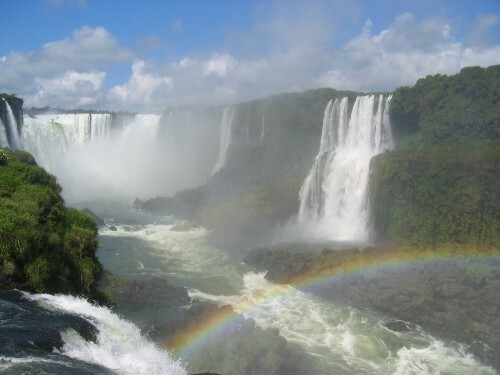 Today we went to Iguazu Falls on the Argentinian side and they totally exceeded all my expectations. The falls cover such a MASSIVE area and are really beautiful. It is set in the middle of rainforest and there are huge brightly coloured butterflies everywhere (poor mum she is terrified of them) and racoons trying to steal your lunch! We spent the day there as there is so much to see and so are all a bit knackered now after our long trek, but we know that we have lots of fun awaiting us tonight at very reasonable prices of which it would be silly not to take advantage! !